This iExpression is used in combination with the "Roller Coaster Master" to animate a series of layers as if they where different wagons of a roller coaster. For more details see the description of "Roller Coaster Master". link here a copy of the Roller Coaster Master, whose output is set to "Master Data". link here a copy of the Roller Coaster Master, whose output is set to "Track Data". allows to build a roller coaster out of several layers (where each layer behaves like one wagon of the rollercoaster). 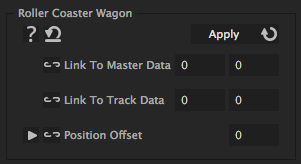 The wagon in the middle should have a position offset of 0 and the wagons before and after it should have appropriate positive or negative offsets to place them before or after the middle wagon.